My husband celebrated his first ever Father's Day last Sunday. As part of his special day, I wanted to make him his absolute favorite breakfast dish from a restaurant who is very well known for their hearty breakfasts. We love Cracker Barrel. I must have their buttermilk biscuits and their fried apples every time I am there. My son is a fan of their pancakes and real maple syrup. But my husband LOVES the hashbrown casserole. So much so that he always gets a double order of it every time we visit Cracker Barrel. 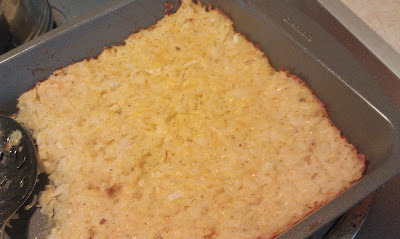 I found a recipe for a copycat version of Cracker Barrel's hashbrown casserole on Food.com. Click here for the recipe. I actually ended up halving this recipe. You can click Servings under the Ingredients for the recipe to change the number of servings. I still used the entire can of cream of chicken soup though. (I know! Cream of chicken soup! Who would have thought?) The smaller serving did not change the bake time. In fact, I baked mine about 10 minutes longer to get that nice cheesy, crisp crust along the edges that you see pictured below. The hashbrown casserole turned out just about exactly like Cracker Barrel's. My husband definitely approved, and that says a lot. ;) This made more than 6 servings though. We were eating leftovers of this for breakfast and lunch for the following two days. For all of my Pinspiration in the Kitchen posts, click here.